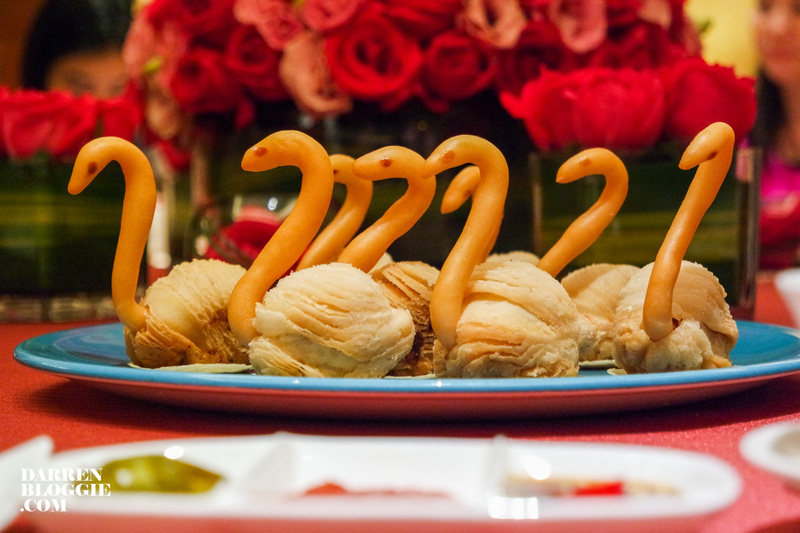 From January 20, 2016, guests can delight in Conrad Centennial Singapore‟s Lunar New Year ‟Prosperity‟ specials, which are available both dine-in and takeaway. 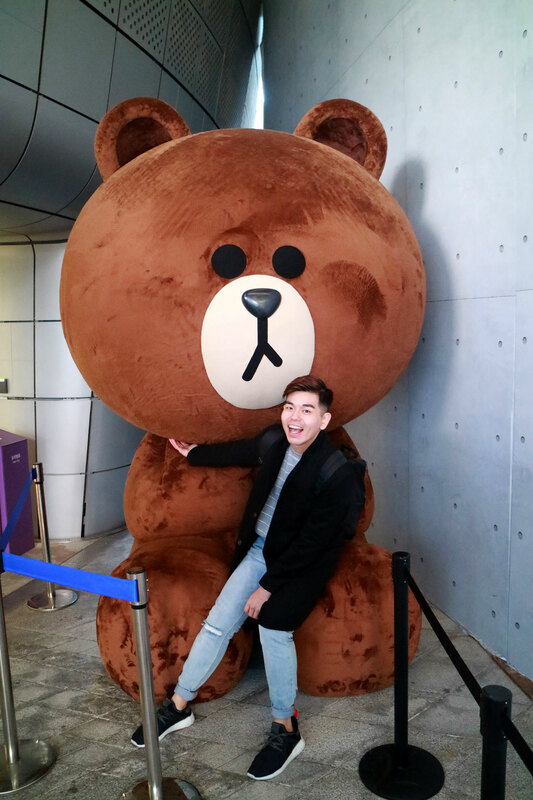 Executive Chinese Chef Ku Keung of award-winning Golden Peony whips up his signature dishes with finishing touches heralding the ‘red fiery’ monkey. 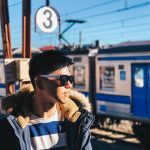 In the spirit of the new year, Oscar‟s will be opened round-the-clock offering supper treats of local flair, including claypot noodles and traditional Chinese congee. 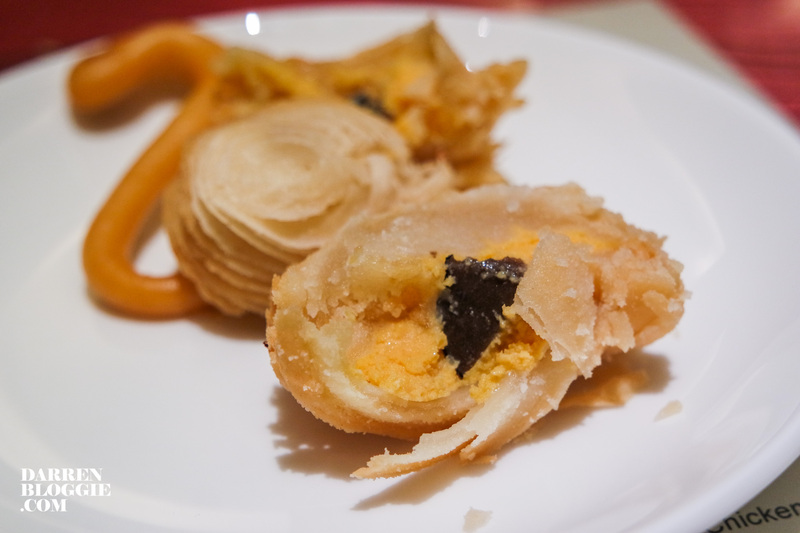 Guests can also opt for “takeaway treasures” in the form of hampers consisting of traditional Chinese goodies that represent abundance and good fortune. 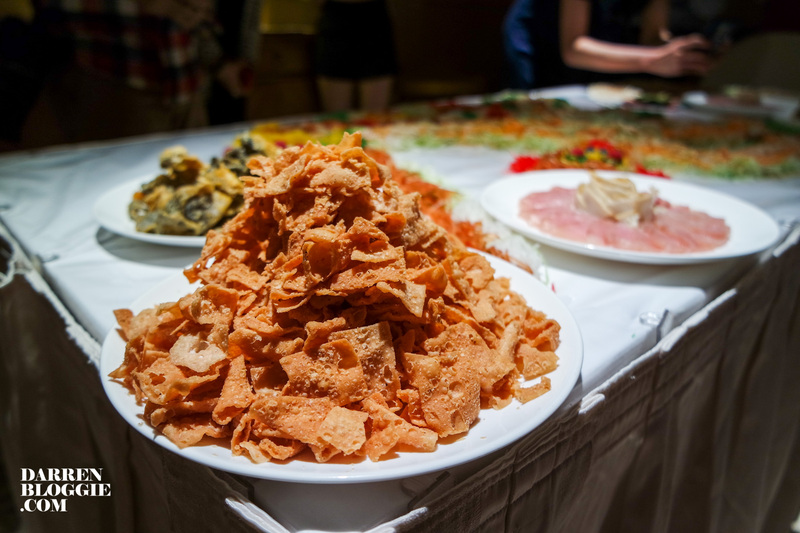 The Fortune ‘Yu Sheng’ (鸿运当头) specially created by Executive Chinese Chef Ku Keung comes with Abalone, Crispy Fish Skin and Crispy White Bait. 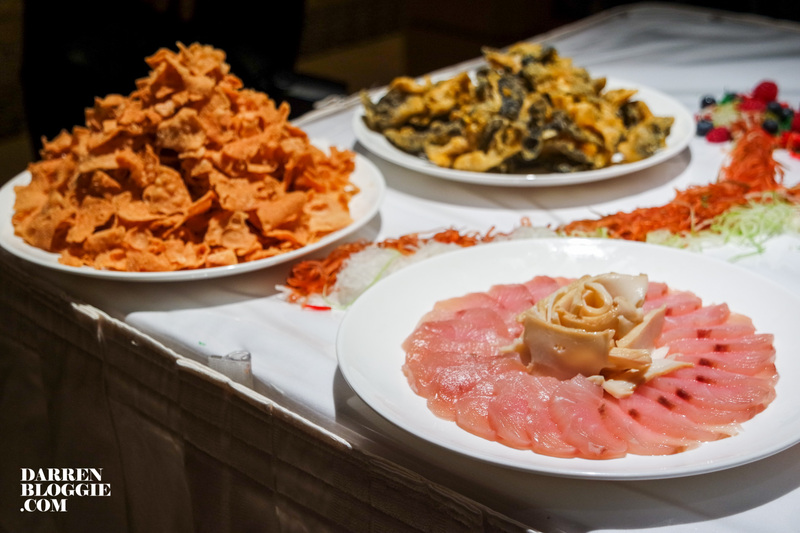 Prepared using the key ingredient Hiramasa 嘻啦玛莎, also known as yellowtail amberjack, is this seasonal superior grade sashimi for its firm, pale pink flesh and a sweet, rich flavour. Topped with my favourite crispy fish skin and white bait, it creates an unique textural twist to this classic dish. 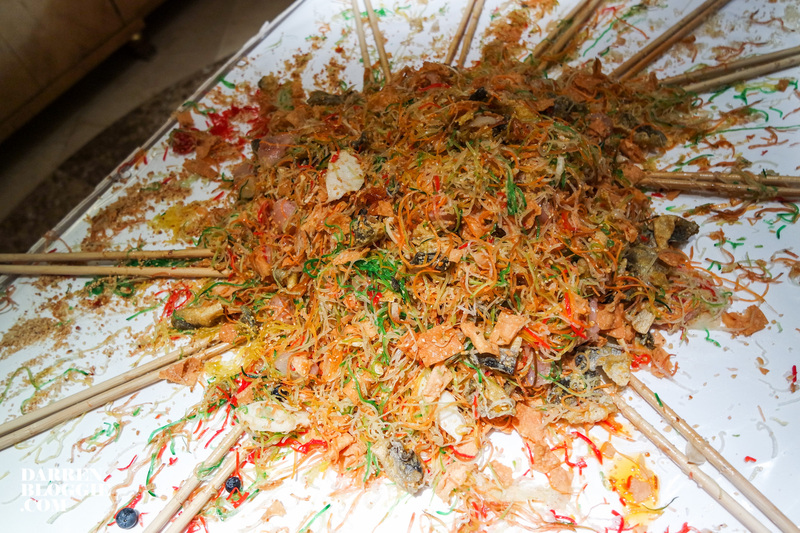 and here’s a LIVE video of our lo hei process! 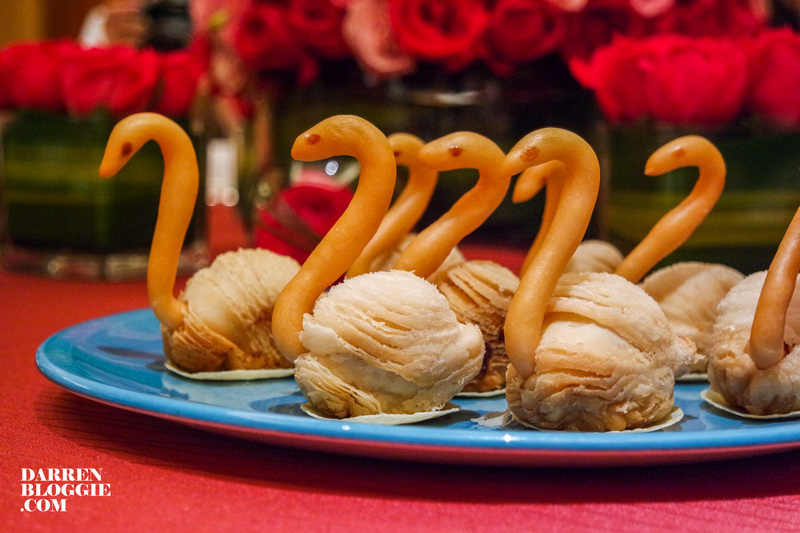 Another interesting and creative dish created by Chef Ku is the Crispy Filo Swan filled with Foie Gras, Truffle and Minced Chicken (天降横财)菘露鹅肝鸡茸天鹅酥. It is not only flavourful but also a feast to the eyes as it is very delicately made. One of my favourite dish for the night. 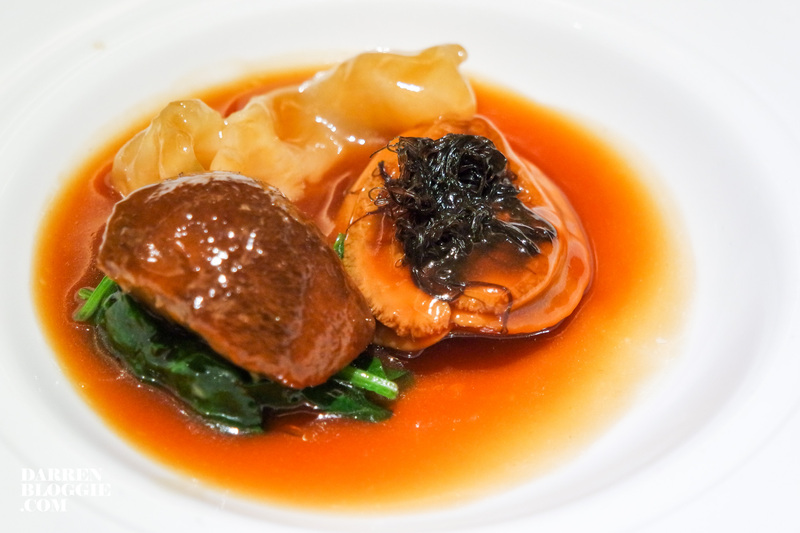 Other interesting dishes such as the Canadian Sea Perch Roll filled with Lobster, Fish Roe in Spinach Purée (财源滚滚)菠菜汁龙珠球 and Braised ‘Monkey Head’ Mushroom (福寿绵绵) 红焖猴头菇 are equally satisfying as well. The last dish for the night before our dessert is another new and innovative dishes by Chef Ku. 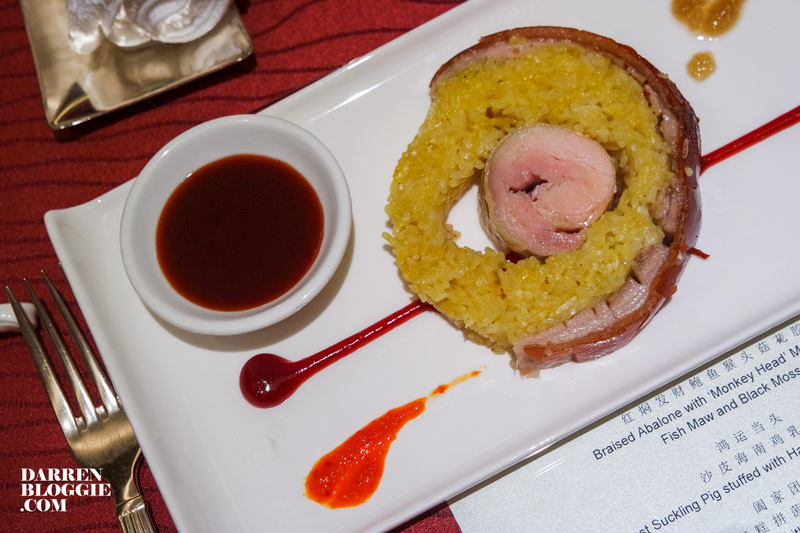 Roast Suckling Pig stuffed with Hainanese Chicken Rice (金猪报喜)沙皮海南乳猪. Get ready to tuck into succulent chicken meat and fragrant rice, laced in light crispy skin that guarantees a crackle with every bite! 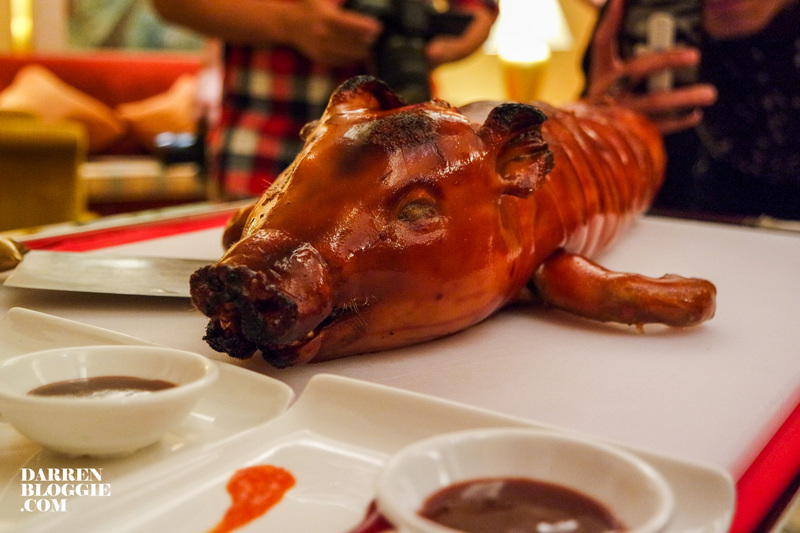 Roast Suckling Pig stuffed with Hainanese Chicken Rice (金猪报喜)沙皮海南乳猪. 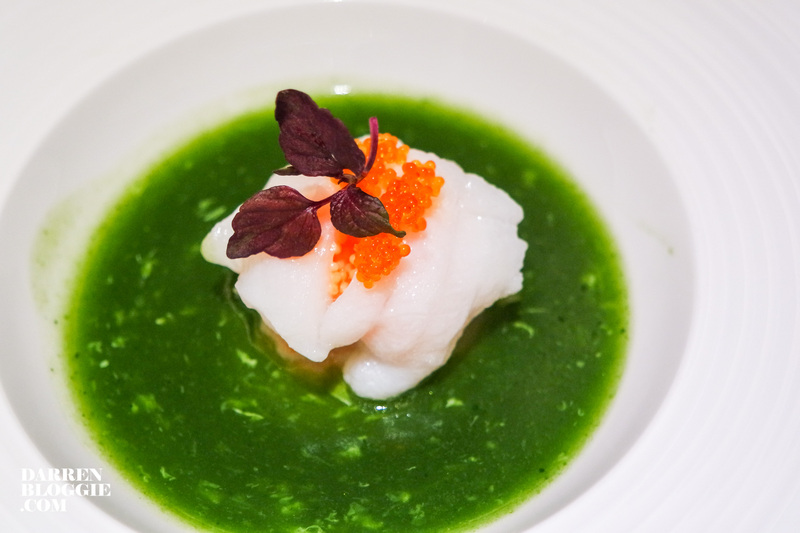 Choose from prosperity set menus for lunch or dinner from S$100++ per person and S$998++ per table of 10 persons. A la carte menu and intimate private salon rooms are available as well. Guests too can take the Golden Peony celebration home with our selection of delectable Lunar New Year takeaway items:from Fortune Yu Sheng,signature dishes such as Roasted Suckling Pig, Duck and Char Siew, Abalone ‘Pen Cai’ or Claypot Rice with Chinese Sausage, Liver Sausage, Waxed Duck and Meat; to sweet treats of Mandarin Orange Kueh Lapis, Pineapple Tarts, ‘Nian Gao’. 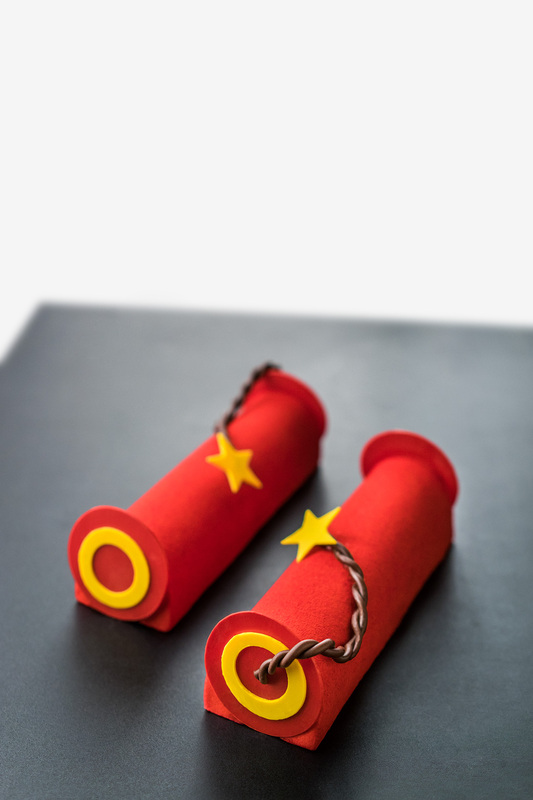 The highlight is the Prosperous Fire Cracker Cake, which has been specially handcrafted by Executive Pastry Chef Bruno Philippe. 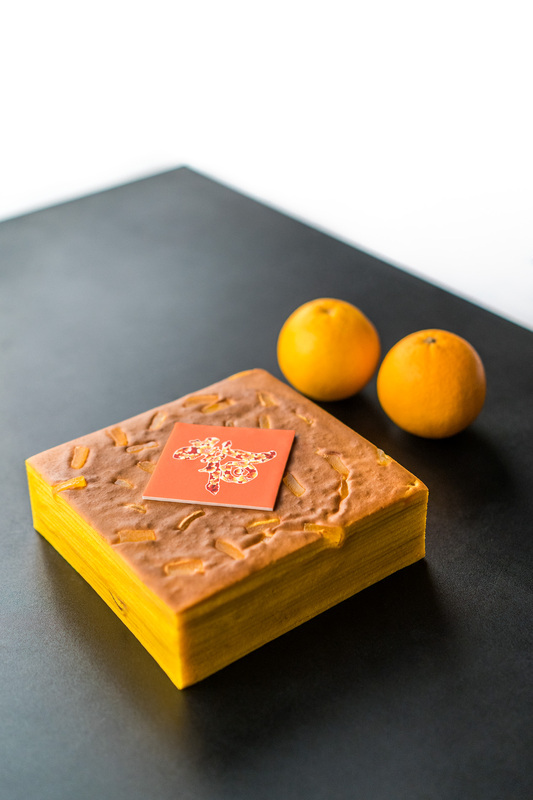 The cake is made of lady finger sponge with longan, goji berry and red dates, crispy feuilletine,and ginseng white chocolate base–all sandwiched with chrysanthemum-infused mousse to give that saccharine sweetness,and wrapped up in a fiery red packaging that will charm the young and the young at heart. 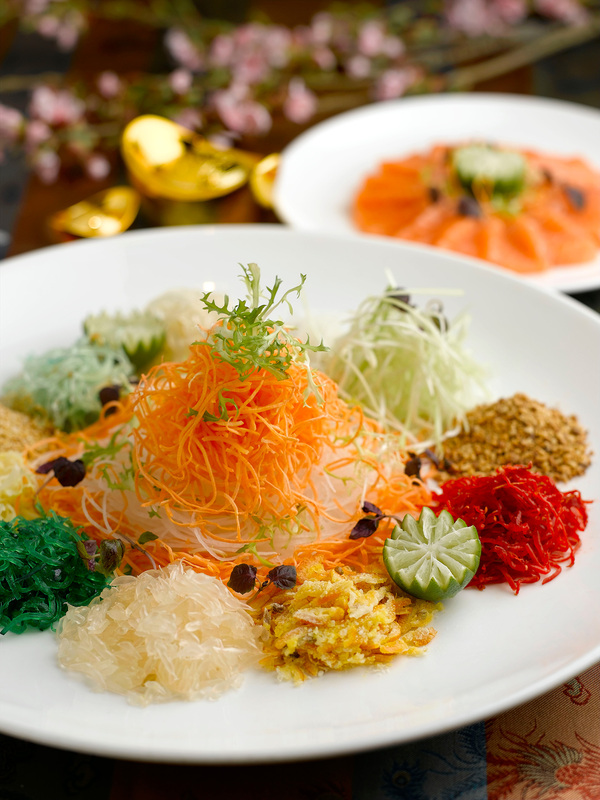 In addition, four varieties of Yu Sheng will be available for takeaway, all made with different types of seafood, refreshing julienne vegetables such as white turnips, carrots, yam as well as accompaniments like pickled ginger and crispy white bait finished in a zesty,homemade sauce. Small portion for2 to 5 persons. Large portion for6 to 10 persons.